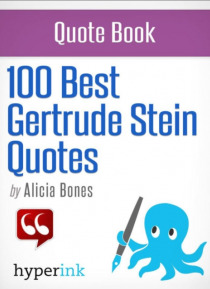 Gertrude Stein has achieved mythic status in the literary world. Her work has been beloved and besmirched, high on the bestseller list and forgotten entirely, called inaccessible, innovative, insane, and all quality polarities in between. Yet, the question remains: Who was the writer and woman behind the mythos? Through quotes taken from her huge body of work and from a mouth that reportedly neve… r stopped flapping, readers can discern Stein as a whole woman, a woman who recognized her own genius, nourished artists of all spheres, loved her partner, Alice B. Toklas, and claimed an American upbringing, but a French soul.